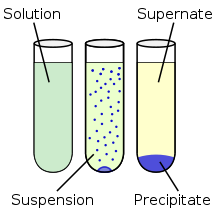 Chemical precipitation is the production of a chemical reaction. When two or more solutions are mixed together, a precipitate mate is formed if the product is not soluble. . This page was last changed on 20 April 2018, at 05:11.